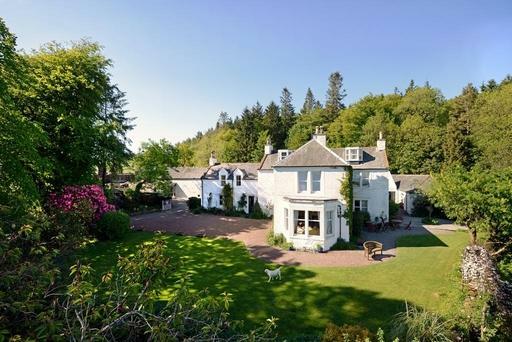 This working estate on the edge of the Galloway Hills is the place to come for an authentic Scottish culinary experience. Farmers and hoteliers Richard and Celia Pickup produce their own organic beef and lamb and also have their own trout loch and Smoker. Craigadam has sporting access to 25,000 acres of shooting and stalking over farmland, moorland and woodland. Pheasants and partridges are reared on the estate and shoots are arranged in season. Celia is an expert game cook and has won many awards for her country cuisine. Game terrine and smoked trout might be followed by pheasant stuffed with haggis and wrapped in pancetta or partridge cooked in an apple and shallot sauce. The elegant wood paneled dining room opens out on to the pretty courtyard which is very popular for weddings. But it's not all about the food - the rooms are wonderful too. Each suite is styled on a particular theme. The 'Scottish Traditional' suite has a tartan canopied bed whilst 'Macintosh' is superbly styled after its namesake. Some rooms have quite exotic themes. The sunny lounge has views over the Galloway Hills and is a comfy place to relax. There's also a billiards room with a full size table and extensive honesty bar - where you'll certainly find a good whisky or two.